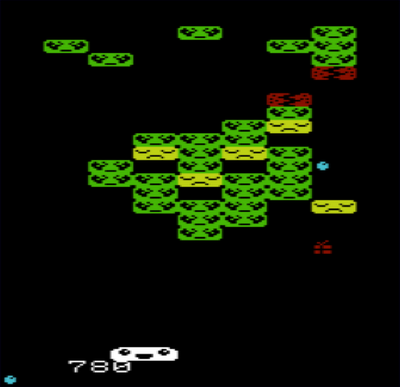 Breakout – one of the earliest videogame archetypes. Effectively one-player Pong, the game originally arrived in the arcades in 1976. Since then it has appeared in various versions for every platform imaginable - so how does Steve McCrea's new interpretation for the VIC20 hold up? Initially – not very well, especially given the choices available in 2012 if you were to suddenly feel the urge to play a breakout clone. However if we start to limit the search criteria a little: games on the unexpanded VIC20, including 'present drops' - and written entirely in BASIC. Now our choices are somewhat more restricted and Kweepout suddenly starts to look like a pack leader. Writing a clone of breakout in BASIC, to illustrate programming techniques, has an obvious antecedent in 'Thro The Wall' (on the Horizons tape that came with the ZX Spectrum, to help budding programmers see how it was done). 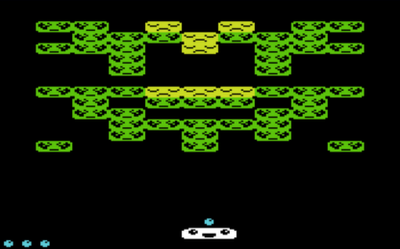 Unlike that game, Kweepout actually succeeds in being quite good fun to play, as well as a technical exercise, and it wouldn't have entirely shamed itself next to early commercial releases for the VIC20. It certainly would have made an unusually high quality type-in game! Interesting block arrangements for different levels, multi-hit and indestructible blocks, plus animation when the blocks are destroyed take it above the standard BASIC fare. Perhaps we shouldn't be too surprised that this piece of programming is impressive, for this is the programmer who gave us The Keep, a frankly astonishing VIC20 Wolfenstein clone (for a 4KB minigame competition no less). 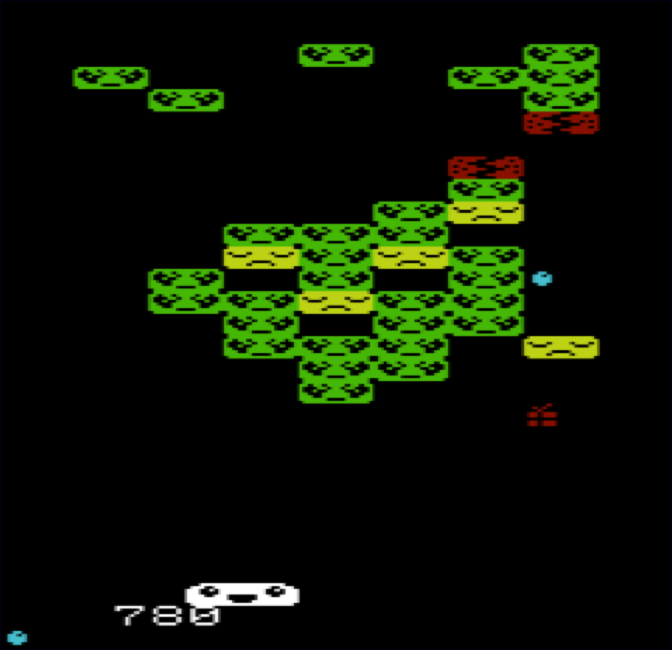 Yes, it is only breakout, and – if the slow pace, and fact that the present drops are very hard to catch (descending at the same rate as the ball) bothers you – Steve has thrown together a Machine Code version which includes stretch bat bonuses, guns, and a slightly improved thinner aspect ratio. This version is much speedier, and could have certainly held its head up in the VIC20 commercial market, as it succeeds in being great fun to play. Take off a joystick from the overall review score for the BASIC version, but – if programming and retro game development is of interest – be sure to check that one out too. Download both versions of the game from here (from the announcement post on Denial).